One signature hole after another. One picture postcard after another. Here, where the ocean meets the land, is as good as a golfer’s life gets. 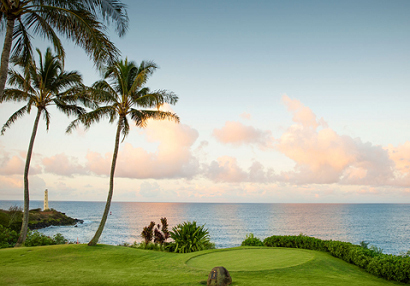 The Ocean Course at Hokuala has been completely renovated in anticipation of your visit, making Hokuala the premier golf resort on Kauai, Hawaii. 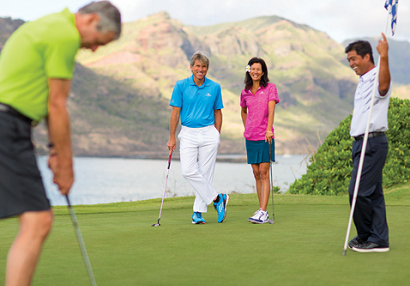 Every aspect of the game at Hokuala benefits from professionals and facilities second to none. The Hokuala Teaching Center is a destination in its own right, with training sessions from renowned PGA instructors equipped with innovative training technology. And our barefoot mini course is a treat for kids of all ages and abilities. Whether you’d like to host your own outing or join up with one of our regular groups, our staff is expert in arranging exceptional tournaments with a uniquely Hawaiian flavor. We’ll see to every detail, from handicapping to catering, from tee prizes to festive awards. The golf program at Hokuala is considered the best on the island – an epic golf experience that will captivate golfers of all abilities. A great professional staff headed by PGA Professional Kellie Hines makes this the perfect place for honing your skills – a place where both young and old will deepen their love for the game.